International Medical Corps’ livelihoods training program in Nangarhar, Kunar and Laghman Provinces in eastern Afghanistan is funded through the U.S. Department of State’s Bureau of Population, Refugees and Migration. 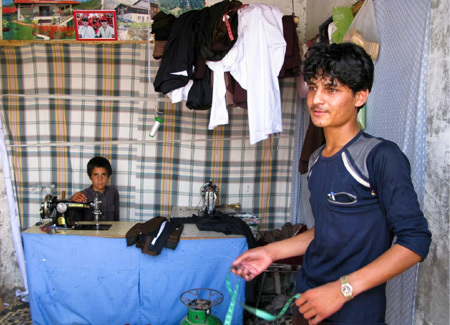 The program aims to support the livelihoods, workforce, and life skills development of refugees and returnees in eastern Afghanistan through vocational and literacy trainings. In 2011–2012, 150 male and female beneficiaries have been supported to learn various trades through apprenticeships and skills training in vocational training centers. All graduates from International Medical Corps’ livelihoods training program are provided with basic start-up kits consisting of tools and other materials that they can use to continue work, earning a salary, or to start their own business. The following are a few of the many success stories from the livelihoods training program. Hazrat Ali is a carpenter in Jalalabad city. He lives in the Woch Tangi settlement on the outskirts of the city with his family, and was selected to participate in International Medical Corps’ livelihoods training program in 2011–2012. He apprenticed at a carpentry shop in the city, where he proudly showed off the wooden carved tables he made. After graduating from the program, he would like to open a carpentry business in Woch Tangi, so he can work close to his home. Isra Rahmat, 18 years old, was a participant in International Medical Corps’ livelihoods training program in 2011–2012. 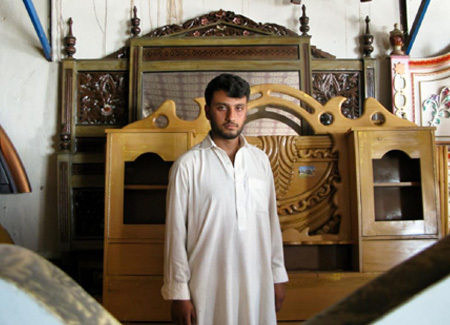 After successfully graduating from his tailoring course, he started his own shop across the street from the workshop of his former master in Sheikh Mesri Township, on the outskirts of Jalalabad city in Nangarhar Province. Today, he makes a comfortable living—enough to support his family, and he is thinking of expanding his business.